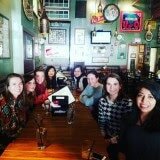 SWE Boston's networking brunch series continues this January at Sunset Cantina on Commonwealth Avenue in Boston! Sunset Cantina is accessible via the Green Line. To check out the menu, please go to this link: http://sunsetboston.com/sunset-cantina/menu/brunch/. This casual networking brunch is limited to 15 due to space limitations at the restaurant, so please RSVP early. There is no registration fee to attend; it is a pay for your own meal event. Please RSVP by Wednesday, January 11 at noon so that we can make table reservations. Hope to see you there!